It may be winter (as if there's a real winter in LA), but you can pretend it's warm with The Church Key's new happy hour. 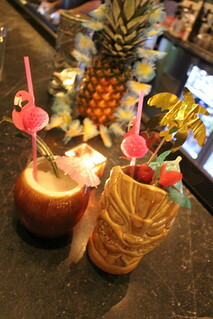 Yep, they're going all tiki for happy hour, taking place Monday-Friday, 5:30-7PM. There's no bad season for tiki. As is always the case with proper tiki drinks, they are strong but dangerously easy to drink. I haven't had one of these in forever, but we let go of our cocktail snobbery for the moment because, well, frankly it tasted delicious. 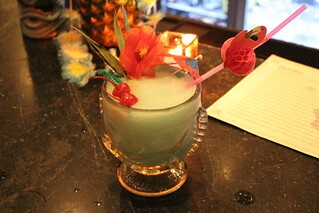 Interestingly, according to Wikipedia this drink should've been the Blue Hawaiian, whereas the Blue Hawaii uses a sweet and sour mix instead of creme de coconut. Either way, I know I would prefer the one with coconut. While Italian restaurants and craft beer and cocktail bars are abound in downtown Los Angeles, 643 North occupies an unusual location: Chinatown. You might be confused driving there through a desolate part of Chinatown, but don't worry, it's there. Plus they have a free parking lot to the left, perks of a cheaper real estate. I was expecting a heavy dish, as ossobuco typically is, but this is light and lovely. 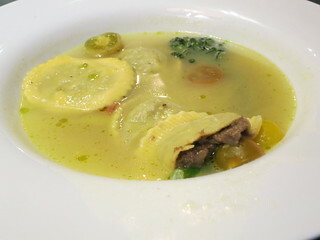 The al dente ravioli sits in a bright parmesan broth, letting diners experience ossobuco in a different way. This was one of the highlights of my meal. 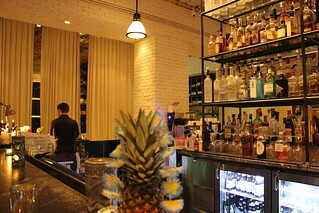 I was also pleasantly surprised with the cocktails here, created by Adam Acuff from Far Bar, which is more known for their beers rather than cocktails (643 North also has a good beer list). 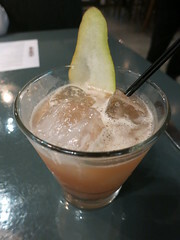 All cocktails are $12 and include drinks like Smokey the Pear (High West Campfire, St Germain, spiced pear syrup, lemon bitters) which was nicely balanced. There's another place that I wish was there when I was a Bruin: TLT Food. 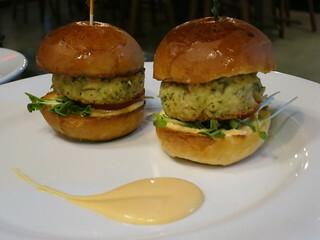 The food options in Westwood Village just keep getting better these days! TLT Food is started by the guy behind The Lime Truck (hence TLT) that started in Orange County and won season 2 of The Great Food Truck Race! 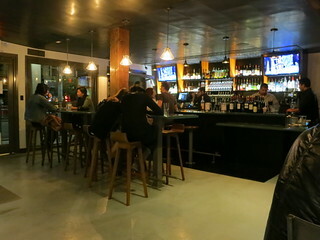 It is a great fast casual option, with beer and wine and free wi-fi. 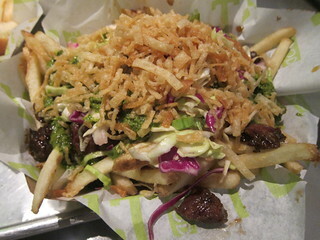 There are sandwiches, sliders, tacos, and fries with an Asian influence. Pretty generous helping of crab meat for $9! 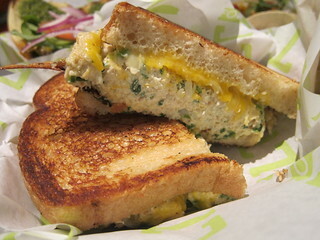 It was mixed with mayo but pretty lightly so you still get plenty of the crab flavor. This was my friend's favorite. It's September but it still sure is warm. 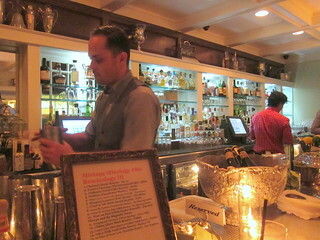 That means you still have time to head over to the Big Bar in Los Feliz for their midsummer cocktails, designed to be the perfect patio drinks! 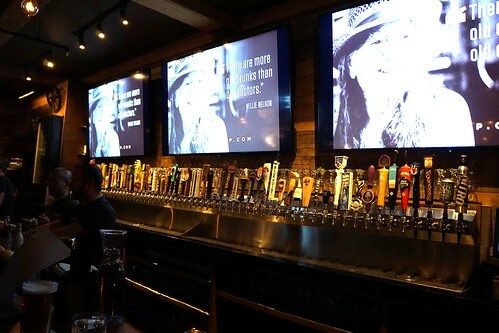 Big Bar is part of the Alcove Cafe and Bakery and yes, they have a beautiful patio that you can sip them in, although we enjoy sitting at the bar watching Dan Long and his bartenders do their work. I loved the Gin and Tonic cocktail. This was obviously not your usual gin and tonic, as you can see it's served up. 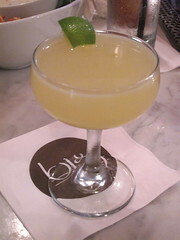 The cocktail was made with Beefeater gin, quinquina, lime, bergamot, kaffir lime spray. 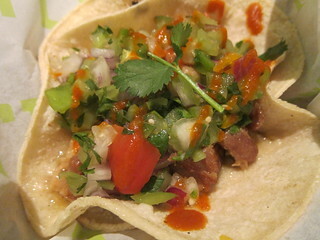 the quinquina gave it that "tonic" flavor. You can also smell the kaffir lime as he is serving it to you. The next one may be my favorite find that night. I can sip this one all night! 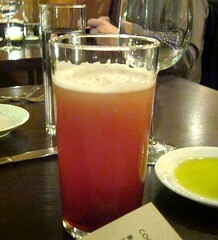 The Picon Punch is a traditional Basque after dinner drink. Traditionally it is made with Picon but that's not available in its original form anymore so they tried to find a substitute with similar flavors. 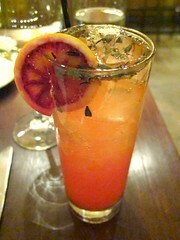 The base is Amaro so it had strong herbal flavors, but if you like that flavor profile you will love this. I thought it was really perfect to calm your tummy after dinner. 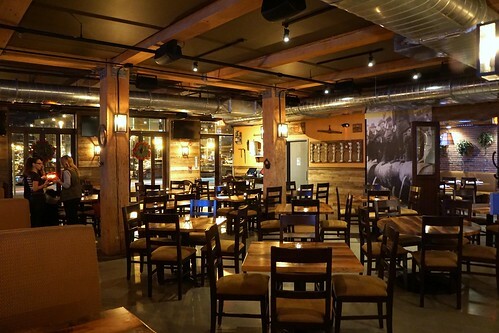 I had been meaning to go to AMMO for a while but had never made it even after a couple of changes on the kitchen helm, but I was recently invited in to try the new cocktail and bar bites menu. 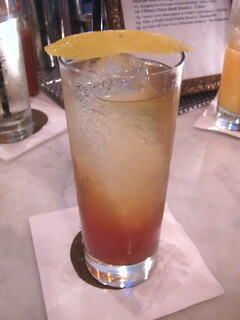 The new cocktail menu had gotten a lot of good press and it was definitely time for me to go. I brought LAOCFoodie as my plus one, since we're tasting cocktails after all and I knew he could handle it! 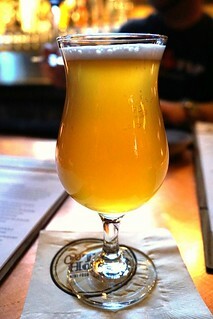 The Crush is pretty light and sweet. A good cocktail to start off with, though I think I actually liked the beer cocktail better - perhaps because I like Lindemans Lambic. Since we were invited to try the cocktails and the bar menu, we stuck with the bar bites for our dinner. 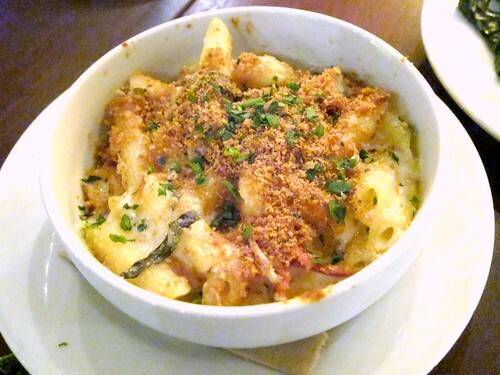 It turned out to be my favorite thing that night, with its gooey, strong melted cheddar! I've always liked the texture of penne better than macaroni anyway.